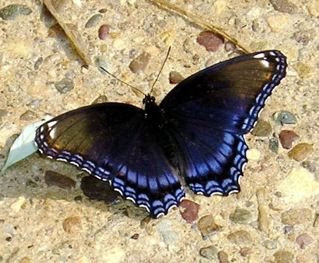 The Red-spotted Purple Admiral is part of the brush-footed butterfly (Nymphalidae) family with a wingspan of 2-1/4 to 4 inches. Like many butterflies having an elaborate defense mechanism against predators, it mimics the Pipevine Swallowtail, whose larvae feed on plants of the birthwort family containing the chemical aristolochic acid which is unpalatable to predators. Since butterflies cannot fly until their wings are warmed, they often sun on rocks and pavement to absorb the heat collected there. Adult food includes sap, rotting fruit, carrion, dung and only occasional nectar from small white flowers with viburnum, spirea, and privet being favorites. You will often find these butterflies in groups taking nourishment from mud puddles on the ground. This butterfly is usually found in deciduous or mixed forests, moist uplands, valley bottoms and coastal plains. Red-Spotted Purple males engage in "puddling," which is a gathering of many butterflies at a patch of mineral rich muddy ground, dung, urine, or carrion. Using their long proboscises, they extract salts and nitrogen which they form into a spermatophore, a sac containing sperm and nutrients that are passed to the female during mating. The female uses the nutrients during egg production and the pheromones of the spermatophore ward off other would be suitors. There are generally two broods from April to October. 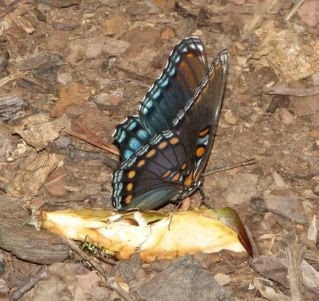 As with all butterflies, eggs are laid on specific plant hosts for the caterpillar or larval stage to feed. Red-spotted Admirals prefer leaves of a variety of trees and shrubs such as poplar, oaks, hawthorn, birch, willows, wild cherry, aspen, basswood, cottonwood and shadbush. Eggs are laid singly on the tip of a host plant leaf and the caterpillar emerges to eat the leaves, spin a chrysalis and emerge as an adult butterfly. The larvae stage of this particular butterfly resembles bird droppings which is a protective provision of nature. 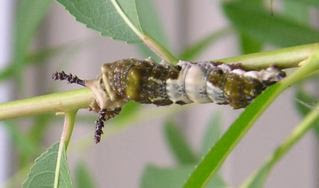 The photo of the caterpillar stage was taken on a Black Willow tree, as was the one that was beginning the spinning of the chrysalis out of which would emerge a butterfly. Several years we have had these caterpillars consume most of one of our Black Willow's leaves, but the tree seemed to do better than the one they laid few eggs on. Maybe there is a symbiotic relationship between caterpillar and host. Our philosophy for our yard has been that we garden not only for ourselves but also for wildlife, so we watch and see what nature does with what is considered to be a pest. Often it turns out to be a beneficial experience for all.